How we dress is often decided by the fashion or the weather seasons, which both are known as constantly changing. There is, however, one type of clothing that never goes out of fashion and can be used all seasons of the year in various forms and models – namely knitted sweaters and the like. 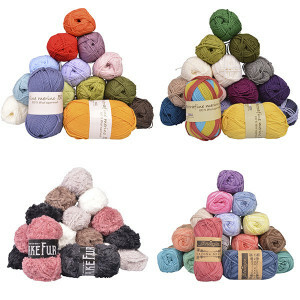 In our webshop, we sell yarn for all seasons, all occasions and for every style. 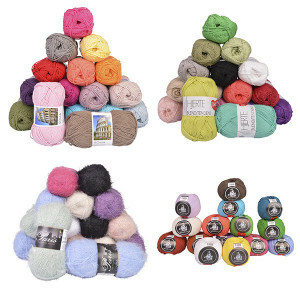 No matter if you’re searching for reflex yarn, wool yarn, durable sock yarn, soft cotton yarn, light silk yarn and linen yarn, exciting effect yarn or yarn for felting, we sell it online, and as an extra bonus, it’s cheap. 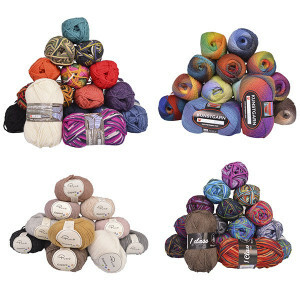 So get both cheap yarn and a huge assortment, buy your yarn online. We all love super products made of quality. For many, good quality equals a lot of money and it’s not every month, there is room for that kind of spending on the budget. At Rito we think and believe, that good quality should be for everyone. Therefore, we can not only guarantee good prices all year round but at the same time, we assure that you can continuously find additional offers and sales that simply can’t be resisted. The good quality remains the same even if the price drops. 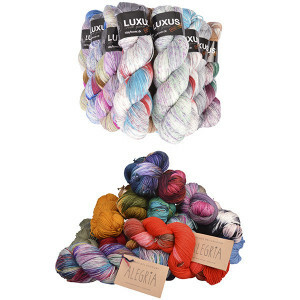 This allows you to either save a lot of money or the opportunity to buy a larger number of yarn skeins without paying a pound extra. And at the end, we always ensure a good service every time you shop at Rito. With British autumn and winter, snow, sludge, and small temperatures follow. If you, like many others, like to keep yourself warm, you're just a click away from the yarn you're looking for. 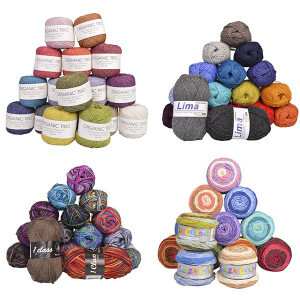 In our range of knitting yarn that keeps you warm, you will among other things find wool yarn. 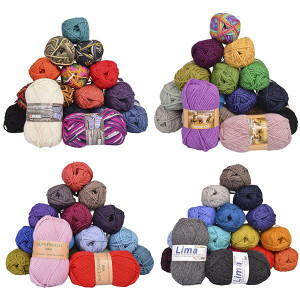 We sell cheap wool in great quality, with wool from sheep, alpacas, lama, and mohair. 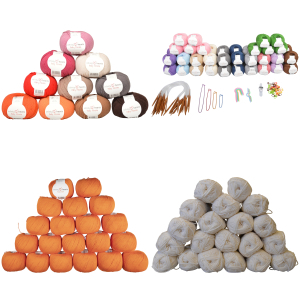 Each of these qualities has different and unique characterizations, but one thing they have in common - each yarn ball can keep you warm and cozy on even the coldest winter days! 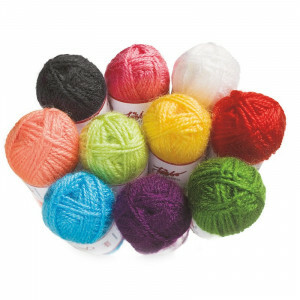 If you, however, want a yarn with different qualities, then that’s also to find in our assortment. If you want to knit beautiful warm clothes and accessories, which at the same time feel extra mild and soft against your skin, you can look for our range of cotton. 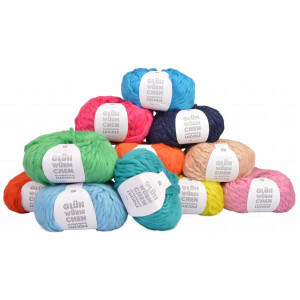 Cotton yarn is especially suitable if you knit for a baby or people with sensitive skin. 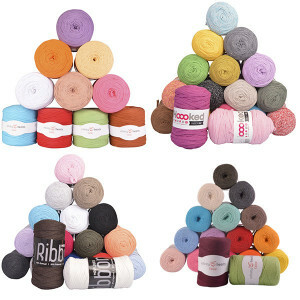 We also sell cheap and delicious sock yarn that will ensure that your feet stay warm for many winters in a row. 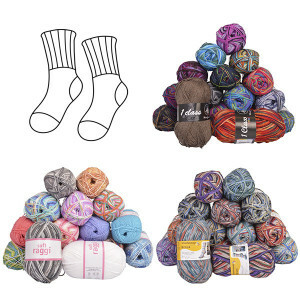 One quality that our sock yarn has is, that it is durable and suitable for an everyday use. That’s due to a superwash treatment that ensures that the knitted sock can be washed in a washing machine up to 40 ° C.
If felting is more your thing, you’ll be happy to know, that many of these qualities are perfect for felting. Felting is often used for hats or beautiful decorations, which create an exciting and different look. The good thing about knitting is, that it is also a hit during the summer. With nice and light knitting yarn, you can knit yourself a light shawl or an airy poncho for the long and shiny summer nights. 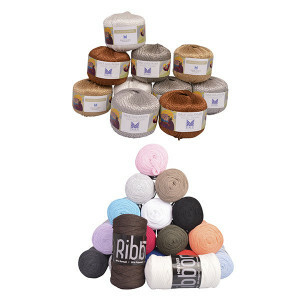 At Rito, we sell cheap silk yarn and linen yarn of high quality, which is perfect for exactly those purposes. Besides being airy and soft the yarn still manages to have a beautiful and elegant look, so it’s suitable for any occasion. 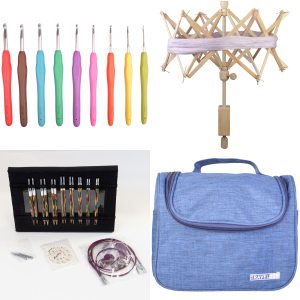 If you want your shawls, ponchos or other things extra airy, it is recommended that you use extra-thick knitting needles, which can also be purchased at a low price in our webshop. These contribute to a result that will warm you without feeling neither heavily nor obscured. 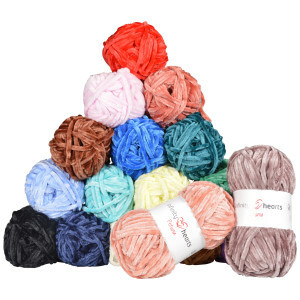 No matter what quality yarn you want to buy, or the occasion for it, we always have a good price, sales and offers on knitting yarn in all colors of the rainbow - and more. 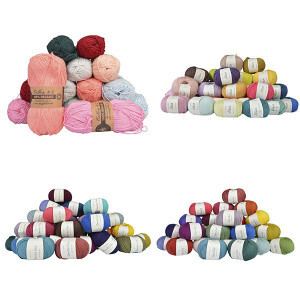 In addition to having beautiful and simple single-colored yarn, we also have effect colors in the assortment. 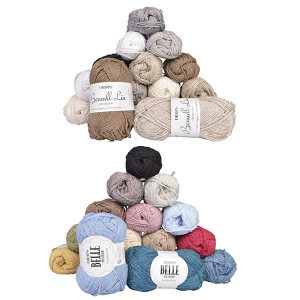 These yarn qualities have beautiful colors, which contain both tweed effect, print, mouline and many other exciting editions of quality yarn. 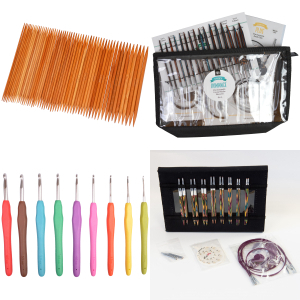 This allows you to customize your knitwear and accessories for all four seasons, as well as any occasion. 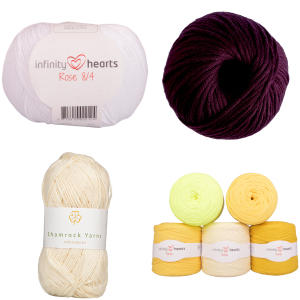 For example, if you want to knit a creation for a baptism, our assortment is full of fine and delicate colors in both hot and cold shades. However, if you want to knit accessories which create life and warmth for even a cold day, you'll find a wide range of strong and deep colors. If you want a little of it all, just discover the different mix effects - it's only the imagination that sets limits! By making your purchase online, you get the best of both worlds. 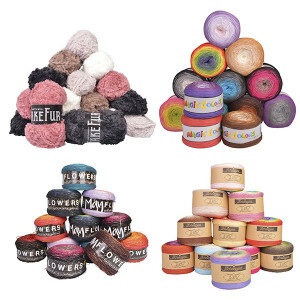 Besides being able to choose between a wide range of different qualities for any purpose and all the colors of the rainbow, you have the opportunity to save a lot of money on the same quality yarn. Great prices, offers, and sales are available all year round at our webshop. The additional benefits of an online purchase include, among other things, that you at any time can skip the queue. 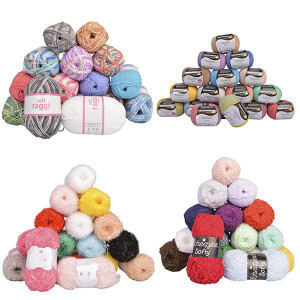 If you cannot find time between work and hobbies to go to town and shop, you can order the yarn online, whenever you like. This also includes outside the normal opening hours of physical stores. In addition, one of the advantages can be, that you can order your yarn while sitting on your couch. Therefore you don’t have to defy the rain or sludge that might be to get the great qualities you need for a nice warm sweater, nice socks or nice warm accessories. As an added bonus, your order will be sent directly to your doorstep, ready for use. If you order your quality yarn online from us, we will guarantee you fast and free shipping if you exceed the limit for free shipping. 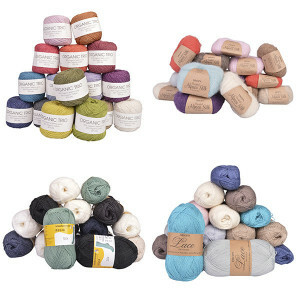 Look through our range and make your yarn purchase today. It won’t be much easier and more fun to shop!